Welcome to an archived copy of www.EllisParkerButler.Info. Created by the late John Martin, this was the best place on the Internet to find information about the life and work of Ellis Parker Butler, American humorist and author. 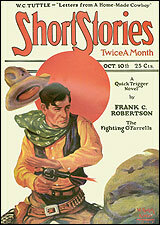 Mr. Butler was -- by any measure and by many times -- the most published author of the pulp fiction era. This is a mirror copy of the site as it appeared shortly before Mr. Martin's death and is presented here as a tribute to his excellent work. 572 different books, articles, poems and stories you can read right here, online! The stories, poems and articles on this site have been read more than 609,910 times. Try our searchable Ellis Parker Butler bibliography of his published works. There are 2,069 entries right now, with more coming online as we find them. Most of Butler's work was not indexed at the time, so it's real detective work to rediscover his forgotten stories. There's a lot of stuff in this bibliography. Poke your nose in and stay awhile! You'll be amply rewarded! In 1916 Steve Porter made a 78 r.p.m. recording of Ellis Parker Butler's famous humorous story " Mrs. Dugan's Discovery ." Playing time is 3 minutes : 25 seconds. 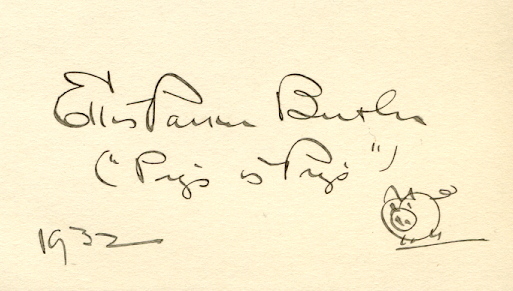 After his success with the story in 1905, Ellis Parker Butler would use "Pigs is Pigs" as a marketing tool for the rest of his work. Since Pigs is Pigs, you see. Because there Pigs is Pork. Author of more than 30 books and more than 2,000 stories, poems and essays, Ellis Parker Butler is most famous for his short story Pigs is Pigs in which Mike Flannery -- a bureaucratic stationmaster -- insists on levying the livestock rate for a shipment of two pet guinea pigs that soon start proliferating geometrically. His book Philo Gubb: Correspondence-School Detective was picked by none other than Ellery Queen (Queen's Quorum #61) as one of the most important detective books ever written. Butler also had great success with his "Billy Brad" stories, his "Swatty" and "Jibby Jones" series of stories for boys, and his "Betty Bliss" and his "Jo Ann" series of stories for girls. Ellis Parker Butler was a member and contributor to New York City's Dutch Treat Club and the Pleiades Club. Both clubs were loosely formed gatherings of authors, illustrators and other literary types. Both clubs held weekly meetings and printed annual year books. The Pleiades Club ceased meeting in 1936 or 1937. The Dutch Treat Club is still meeting today. Most of the stories and articles available on this web site have not been reprinted or reproduced since their original publication. These web sites have links pointing to this one. The most recent web site database update was made on Tuesday, September 12, 2007 at 1:55:58pm USA Central.